Bali, Indonesia -- The popular culinary experience of the Indonesian island has been named the Seven Star Luxury Award winner at the awards ceremony this weekend. Bali Food Safari has been turning heads with their premium food tours and commitment to unique and magnificent food experience since they started in 2013. Recognised as the ‘Oscars of luxury and lifestyle’ the Seven Stars Magazine has hosted the awards in alternate regions each year, this year being hosted in Bali. Bali Food Safari was nominated for the “Seven Star Experience” category competing with eight (8) other impressive experiences from all over the world. The Seven Stars Luxury Hospitality and Lifestyle Awards are one of the most exclusive in the hospitality and lifestyle industry. Winners are selected by the luxury panel members of the awards and placed in competition with top properties in similar regions. Special award segment honours are given directly to the winning company and are considered a lifetime achievement. Simon Ward, founder and owner of Bali Food Safari, accepted the award at The Trans Resort Bali to an audience of over 250 attendees. “Bali Food Safari endeavours to be at the forefront of luxury and lifestyle experiences with every single one of our guests enjoying the mystery dining adventure into the culinary heart of Bali.” Ward continued “This award is a testament to the plethora of amazingly talented chefs in Bali and our team for their passion, pursuit of excellence. we aim at being the leaders in food tourism experiences and the discovery of new exciting culinary destinations”. Gerokgak, Buleleng, September 23rd 2015 - The groundbreaking of a new "Glamping" concept resort on the coast of North Bali opposite Menjangan Island took place with local officials, company directors and government officials attending the event hosted by the owning company; PT Prapat Agung. "This new luxurious all tented resort will provide a unique and different experience from other resorts in Bali" commented President Director, Sandy Rachmat, "Bali currently has an ever increasing supply however nothing quite as unique and different to offer guests". The resort will be called the Menjangan Dynasty Resort, Beach Camp and Dive Centre and is scheduled to be completed and ready for operation by August 2016 and will be operated under Prime Plaza Hotels and Resorts. The resort is located on an isolated peninsula on over 16 hectares and surrounded on three sides by ocean and a calm lagoon with a white sandy beach making it the ultimate retreat in Northwest Bali. Initially the resort will comprise of 24 tented suites and two, two bedroomed tented villas and two one bedroomed tented villas with the villas all having their own private plunge pools. The tented Villas will be located on the most westerly point of the property and set back from a small cliff with uninterrupted views of the ocean, Menjangan Island, the National Park and an impressive backdrop of a massif of three mountains in east Java, perfect for the daily sunset. The tented Suites will be located near the white sandy beach and overlooking the calm and sheltered lagoon with once again a dramatic backdrop of a mountain range in the Bali National Park. Other facilities will include a large infinity pool on the cliffs edge with a waterfall that cascades into a lower pool which will be located adjacent to the Bamboo Beach Club on the pristine white sands, a Dive Centre, Spa, Exercise room, bamboo lobby and bamboo Wantilan offering a space for weddings, events or retreats with unsurpassable views. 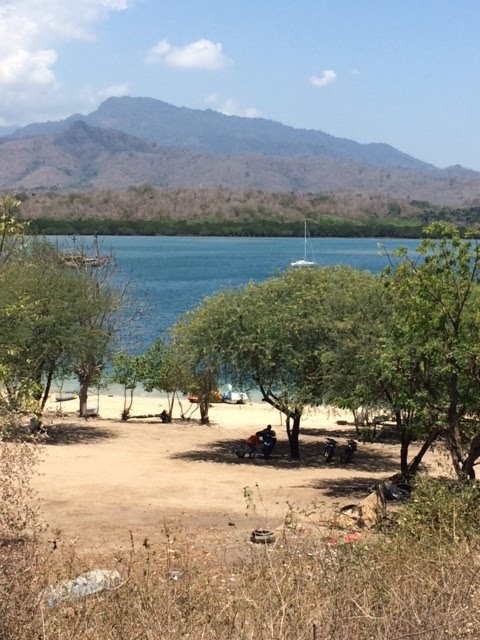 The northwest Coast of Bali has become increasingly popular amongst Europeans looking for an authentic escape offering an unspoilt environment in which to relax and take in what both the culture and nature has to offer. Within the area there are many attractions and activities to partake in including diving or snorkelling at Menjangan (a 15 minute boat trip from the Resort), the Atlas Pearl farms, the quiet village of Pemuteran, trekking, cycling, horse riding, Hot Springs and secret waterfalls to name but a few. Prime Plaza Hotels and Resorts currently owns and manages 10 properties under Prime Plaza Hotels, Prime Plaza Resorts and Villas and PrimeBiz Hotel brands with more hotels targeted to open in 2016 and beyond. Prime Plaza Hotels and Resorts currently operates five hotels in Bali including the Bali Dynasty Resort, Sanur Paradise Plaza Hotel, The Sanur Paradise Suites, the Amadea Resort and Villas Seminyak and PrimeBiz Kuta. Nusa Dua, Bali, September 2015… Prego at The Westin Resort Nusa Dua, Bali is delighted to announce the launch of a series of hands-on cooking classes that will start in the month of October 2015. 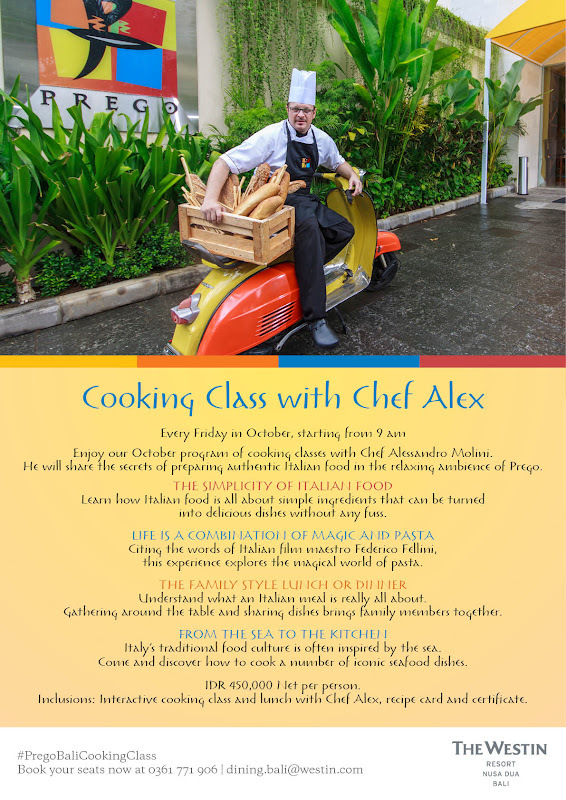 Chef Alessandro Molini or known as Chef Alex will be sharing his culinary secrets on preparing authentic Italian cuisine with audiences of enthusiastic participants. Every Friday in October 2015, starting from 9am onwards, there will be a different theme inspired by the food and dining culture of Italy. Classes will take place in the upbeat ambience of Prego and will involve interactive cooking followed by a delicious lunch. The classes will provide an opportunity for guests to learn new skills under the expert guidance of a seasoned professional. Chef Alex grew up surrounded by good food cooked with love in his hometown of Montecrestese, Italy. He has a particular passion for baking and is keen to motivate aspiring home cooks. One of the cooking classes will unveil the simplicity of Italian food using just a handful of key ingredients and minimal fuss. Another delves into the magical world of pasta, which is made fresh daily in almost every Italian home. Chef Alex will also explain how the Italian tradition of gathering around the table and sharing dishes brings family members together. The final class in the series will show how Italy’s food culture is driven by fresh ingredients from the sea. Participants will learn how to create a number of iconic seafood dishes. Classes are priced at just IDR 450,000 Net per person for a minimum of 10 participants. This includes a certificate, Chef Alex recipe card and lunch at Prego.